H has been hinting that its been awhile since I last bake scones.... unsure... and didn't want to argue... all I could say was 'errrr... I think so' while in my head I was doing a 180 degree turn and thinking... 'Didn't I just bake some recently?'. Quietly... I referred to my Notebook, and guess what? H was right. September 2009 was the last time I baked scones... time sure flies. Not wanting to keep him waiting for another 2 years...that same weekend... I made strawberry jam and baked him scones... and this was 2 weeks ago. H: did you see the scones? H: Its huge.... I was tempted ... but I bet they aren't as light and delicious... as the ones you baked. Sieve plain flour with baking powder twice. Add cream, aerated lemonade and salt. Use butter knife and in chopping motion﻿, mix well. Lightly floured the pastry board and the circular cookie cutter. Roll out with floured rolling pin to a 2.5cm thickness. Lisa, your scones looks delicious beautiful. Thanks for reminding me, I had not baked scones for quite sometimes. your writing is soo hilariously cute! the emoticons just add to it :) Lovely scones too! These scones are beautiful. They look very nice and fluffy. Yum! I want a few for my breakfast now! They look so fresh and tempting! aawww so sweet :) But seriously time flies but making note of everyday meal is amazing .. actually quite like the idea. ! Between you and me, the same is happening with Vijay and I. Not a fan of scones but yours do look soft and fluffy, good for H! Beautiful scones! That is one of my favorite afternoon tea treats. I know, bathing in sweet moments, time flies : ). No doubt why gentleman has been so obsessed because your scones look really gorgeous. Ngap all you want Chah..
Those are such beautiful scones, so tall and fluffy looking. Now that's a great way to start the day. Love your writing, its more personal and fun, the scones look fluffy and soft. And H is such a sweet person. Love the posts. Lisa, what type of cream did you use. They look like my grandma's. Thanks for sharing! 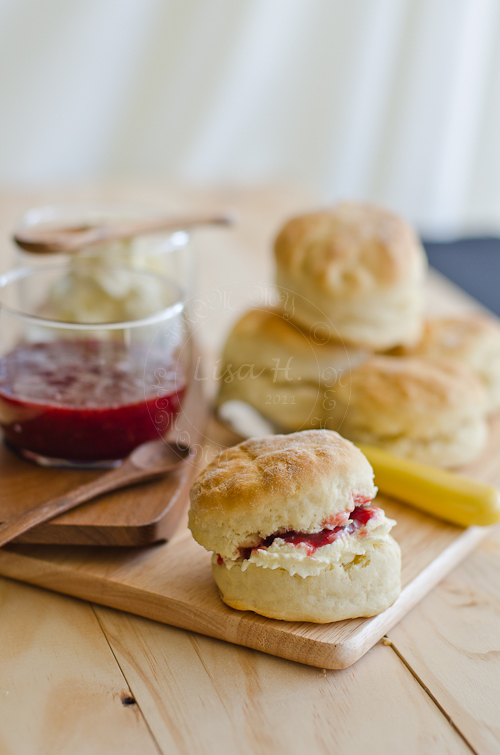 its so hard to get good scones outside fr the shops.. yours looks so good! Btw, aerated lemonade, do u mean whisked lemonade or lemonade from a siphon? Hmm, it must have been about two years ago that I last made scones too and they were certainly not the best I ever had either! Which means I am going to be tempting to make your recipe soon! Looks gorgeous! they look great, i'm not surprised when he said that the batch that you made earlier was better than gloria jeans's ones. i really like the crops and the set up here for the picture taking! oh wow, now I'm def going to be making this for hubby when he wakes up. 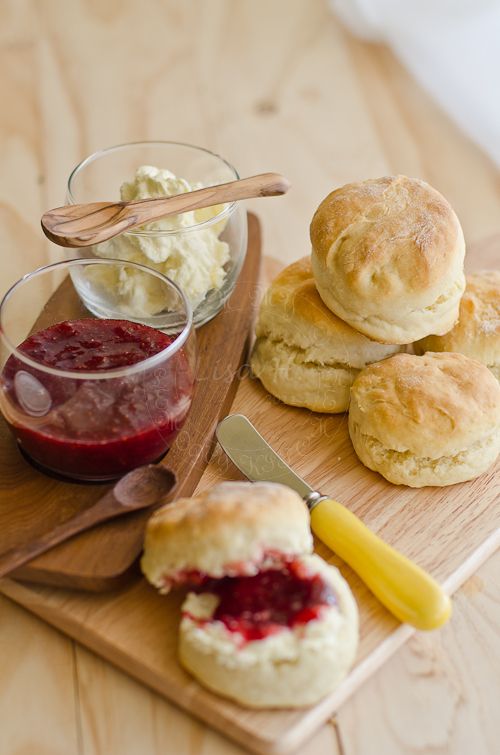 Its saturday here in melbourne, so might surprise him with these lovely scones. Thanks lisa! I'd love some right now with my coffee. they look esquisite! gorgeous clicks lisa! They look so beautiful! Awesome clicks! I only have thickened cream in the fridge, can i use that instead of the double cream. Will it make any difference? Hi Lisa, I stumbled across your blog through TasteSpotting. Great scone recipe, worked out so well!! The only problem is that I don't think I've made enough!